When you reflect on music, you essentially dwell on the aesthetics that ought to come with life. It is especially when you think of the songs that once were part of life, in these parts, that you know how much of good music has gone missing in our times. You might have cause to remember the romantic numbers sung by Saiful Islam. No, he did not have very many songs in his repertoire, but those that he did sing have remained part of our consciousness. In Tumi Shondhakasher Tarar Moto Amar Mone Jolbe, there is the pristine about love that emerges from the depths of the lyrics. It is this depth, or call it substantiveness, that has largely gone missing today. Where once you heard music, today you are witness to the loud silences that occupy the spaces where songs used to be. Khondokar Faruk Ahmed had the incorrigibly romantic about him. His songs carried us through our youth. And why not? When you recall that lilting number, Ami Nijer Mone / Nijei Jeno / Gopone Dhora Porhhechhi, you can hardly stop yourself from lapsing into nostalgia. But that would again be only natural. The past has always been a landscape of amazing grace and unending beauty. Anjuman Ara Begum's Akasher Haate Achhe Ek Raash Neel (there is a bit of Bashir Ahmed at the beginning) remains strong proof of the power of music to shape our sensibilities. Anjuman Ara carried music to newer heights when she sang Brishti Jokhon Porhhe Shobuj Boney / Ma Ke Amar Shudhui Porhhe Mone. Hum along, and you might recreate in yourself the springtime that once defined life for you. It was a time when songs had meaning and hearts were huge receptacles in wait for melody. You cannot forget Mahmudunnabi's Tumi Kokhon Eshe Darhinye Achho Amar Ojante / Amar Gaan-er O Prante. You imagine the first, tentative footfalls of a woman as she makes her way to you, you who have given her reason to love and be loved. What more than that song can she ask for? For yourself, there is that other Mahmuddunnabi number you cannot let go of. In Ke Jeno Aaj Amar Chokhe / Notun Alo Duliye Dilo, there is ecstasy of a kind. You have stepped into a new world, which opens out to another world. You call it the heart. Isn't it amazing how the beats in our hearts take a leap when we remember the songs we sang in our schooldays and then in college and university? Nostalgia is all as you try recreating Bashir Ahmed's old cadences in such songs as Tomar Kajol Kesh Chhorhalo Bole / Ei Raat Emon Modhur. There is too the unforgettable Pinjor Khule Diyechhi / Ja Kichhu Kotha Chhilo Bhule Giyechhi. We who have stepped into middle age will not likely stop crooning the old tunes, for the old songs were symbolic of our innocence. Those were rainbow times and they came dappled in the profundity of song. Ferdousi Rahman's Amar Ondho Moner Bondho Duar / Khulte Cheyona / Tumi Byatha Peyo Na has always been a window to the lugubrious soul in us. There is a persistence of sadness in us, for life is a saddening affair. Is that the reason why sad music occupies such a large part of our souls? The sadness goes spiritual at times, as in Syed Abdul Hadi's Achhen Amar Muktar / Achhen Amar Barrister. Or it can be perfectly maudlin, as in Mohammad Khurshid Alam's Bondi Pakhir Moto / Mon-ta Kende Morey. In the 1970s, a new dimension was added to music with the arrival on the scene of such artistes as Rathindranath Roy. His Shadher Lau Banailo Morey Boiragi has since his day been sung by a good number of other singers, but nothing has beaten the depth he brought to the original. In that same era, or soon after, there was a bit more of Runa Laila. Onek Brishti Jhore Tumi Ele speaks of passion in the softness of rain. In Sabina Yasmeen, the softness of love comes on the wings of slight desperation. Recall Osru Diye Lekha Ei Gaan and you will know. And you knew of the call of the heart in an earlier era as well, when you heard Shahnaz Begum (before she turned into Rahmatullah) sing Phooler Kaane Bhromor Eshe / Chupi Chupi Bole Jaye / Tomaye Amar Sharati Hridoye / Nirobe Jorhate Chaye. Shahnaz and her peers have remained musical icons we constantly refer to in these days of murderous mediocrity. We refer to Naheed Niazi and her unforgettable number, Akasher Oi Miti Miti Tarar Shaathe Koibo Kotha.There are all the tales of Nina Hamid and Anwaruddin Khan and Farida Yasmeen and Mohammad Ali Siddiqui we remember. And there are others as well. Khaled Hussain's rendering of Shei Champa Nodir Teere / Dekha Hobe Abar / Jodi Phagun Aashe-go Phire is music we heard in the early 1970s. And we have not forgotten it, as we have not forgotten Bashir Ahmed's Aami Baul Meghomala / Bheshe Berhai Batashe. And Abdul Jabbar? 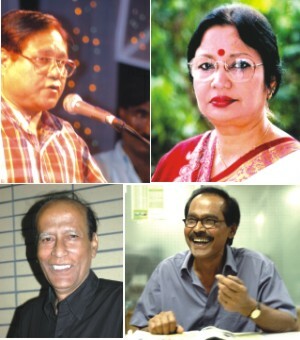 The story of Bangladesh's music as it progressed through the 1960s would be incomplete without singing his songs. Remember Ogo Lajuk Lata Shudhu Ei Logone / Mon Chaye Nirobe Tomare / Keno Baare Baare? And, of course, that Ato Tuku Asha number, Tumi Ki Dekhechho Kobhu, insistently pulls us back to our past.Speaking of the past, do not forget K.G. Mustafa's Tomare Legechhe Ato Je Bhalo / Chand Bujhi Ta Jaane. Talat Mahmood took the lyrics to cosmic heights. We still sing the song --- and remember the women we loved when we were young. Those women are gone. And the song remains a stepping-stone to memory.